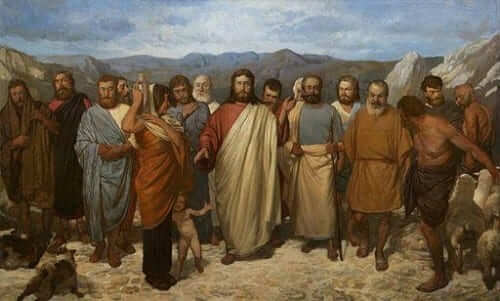 Jesus gives His Apostles a sacred authority. They were able to drive out demons and heal the sick. They also won many converts to Christ by their preaching. It’s interesting to look at this extraordinary charism the Apostles had to act miraculously. It’s interesting because we do not see this happen that often today. However, at the beginnings of the Church it seems that miracles were quite common. One reason for this is that Jesus made quite a statement in the beginning to set things in motion. The miracles He did and those of His Apostles were powerful signs of the power and presence of God. These miracles helped the preaching of the Apostles to be more believable and bring forth many converts. It seems that, as the Church grew, miracles in such great numbers were not as necessary for the authentication of the Word of God. The personal lives and witness of believers eventually were sufficient to spread the Gospel without the help of numerous miracles. Martyrdom and acts of great faith became the true signs of God’s presence. This is helpful to understand because we see something similar in our own lives of faith and conversion. Often times, in the beginning of our faith journey, we have many powerful experiences of God’s presence. There may be deep consoling spiritual feelings and a clear sense that God is with us. But over time, these feelings can start to disappear and we can wonder where they went or wonder if we have done something wrong. There is an important spiritual lesson here. As our faith deepens, the spiritual consolations we may receive at the beginning can often fade away because God wants us to love and serve Him out of a more purified faith and love. We should believe and follow Him not because He makes us feel good, but because it is good and right to love and serve Him. This can be a difficult lesson to learn but an essential one. Reflect, today, upon how deep and sustaining your faith is. Do you know and love God even when things are hard and when He seems far away? Those moments, more than any, are the moments when your personal faith and conversion can grow the strongest. Lord, help my faith in You and my love of You to be deep, stable and strong. Help me to rely upon that faith more than upon any external “miracles” or feelings. Help me to love You first and foremost out of a pure love for You. Jesus, I trust in You. If so, did you know that Amazon will donate approximately 7% of your purchase to “My Catholic Life!” when you use this referral link below? This is at no cost to you! You can also support this ministry with a recurring or onetime gift via PayPal Giving Fund.